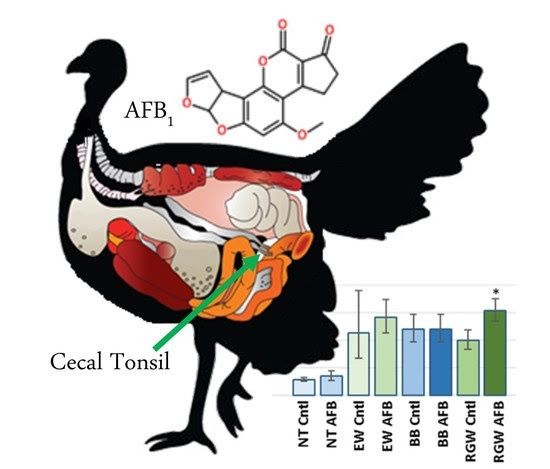 The paper, "Differential Transcriptome Responses to Aflatoxin B1 in the Cecal Tonsil of Susceptible and Resistant Turkeys," by Kent Reed, Kristelle Mendoza, and Roger Coulombe, Jr. was published in Toxins journal. This study is the first to examine the transcriptome of the turkey cecal tonsil region of gastro-intestinal tract. Importantly it combines RNAseq and gene expression analysis and identifies key gene transcripts modulated in response to dietary AFB1treatment. This study is the first to examine the transcriptome of the turkey cecal tonsil region of gastro-intestinal tract. Importantly it combines RNAseq and gene expression analysis and identifies key gene transcripts modulated in response to dietary AFB1 treatment.